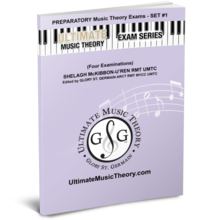 Preparatory Music Theory Exams Set 2 Workbook contains Four Exams, Plus UMT Tips to help Students Score 100% on Royal Conservatory of Music Theory Exams. Preparatory Exam Set 2 has been added successfully to your wishlist. 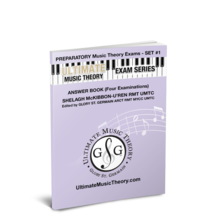 The Preparatory Music Theory Exams Set 2 Workbook is a "MUST" for successful preparation for the Advanced Music Theory Exam. Preparing for nationally recognized exams including the Royal Conservatory of Music Exams, just got easier! 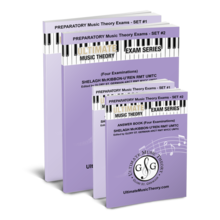 Preparatory Exam Pack Set 1 & 2 has been added successfully to your wishlist. Preparatory Exam Set 1 has been added successfully to your wishlist. Preparatory Exam Set 1 Answers has been added successfully to your wishlist. Preparatory Exam Set 2 Answers has been added successfully to your wishlist.